Surgical skill enhancement for the residents under training can be performed through various efforts. Here in this report, the authors describe a technique of corneoscleral perforation repair on goat's eye, as the tissue resemblance and the reality of experience while performing crucial steps are similar to human eyes. Beginning from tissue handling, optimal suture placement was taught with an intention to impart quality techniques of traumatic globe injury repair. Therefore, rather than training on expensive artificial eye model, training budding surgeons on goat's eye gives much more realistic tissue handling experiences in the presence of constant challenges almost similar to human eyes. Quality surgical skill teaching is an important aspect of the resident training program, because the pattern of ocular injuries in pediatric and adult population may vary from simple to grievous injuries.,,,,, In routine training programs, theoretical and examination skills are often dealt in detail; however, acquisition of finer surgical skills is often a tough task and it can only be obtained through continuous practice. There are reports in the literature which have evaluated the effect of surgical training on artificial eyes/goat's eye and other models for mainly cataract surgery skills' enhancement. Similarly, few other studies have evaluated the vitreoretinal surgical skill enhancement.,,, In literature, there is a clear lack of surgical skill enhancement techniques under complex circumstances like traumatic globe injuries. In addition, the major limitation of these techniques is the lack of real tissue experience, which indeed is the most important aspect in enhancing the microscopic surgical skills. Here in this report, the authors discuss the technique and important advantages of resident teaching on goat's eye for induced corneoscleral perforation. At our national ophthalmic surgical skill development laboratory, enucleated goats' eyes are carefully inspected for regularity and clarity of the ocular surface. The prepared eyes are mounted on a mannequin head and are exposed in such a way that the sclera, limbus, and corneal peripheral are clearly visible for surgical maneuvering [Figure 1]a. The necessary instruments are provided to the residents [Figure 1]b, and subsequently, using a scalpel blade an incision is made along the corneoscleral limbus and across so as to simulate a full-thickness posttraumatic wound [Figure 1]c.
Under the direct guidance of senior resident (with at least 6 years of experience in traumatic globe injuries repair), the junior residents were trained to repair the wounds in a stepwise manner. The residents under training have already had an experience of assisting surgical repair of traumatic cases to a senior surgeon under emergency setup, and therefore they had an orientation regarding the basic steps of surgical repair. The prolapsed vitreous at the wound was shaved with the help of a dry cotton swab and Vannas scissors followed by reposition of the prolapsed iris and uveal tissue [Figure 1]d. The anterior chamber was reformed with viscoelastic material after making two entries into the anterior chamber with the help of micro vitreoretinal blades [Figure 1]e. The corneal wound is closed with the help of 10-0 monofilament nylon (MFN) suture from the periphery to the center and the side wounds were also closed with 10-0 MFN sutures [Figure 1]f and [Figure 1]g. The scleral wound is closed with the help of intermittent 6-0 polyglactin absorbable sutures at a depth of 60%–80% of the total thickness [Figure 1]h and [Figure 1]i. All the sutures were buried completely, and if any sutures were broken they are replaced with fresh sutures and the surgery was completed. Apprenticeship style of resident training is an effective way of surgical skill transfer for the younger generation. However, with growing technology and the need for précised surgical skills, training on surgical simulators and other wet laboratories exercises are increasingly becoming popular. 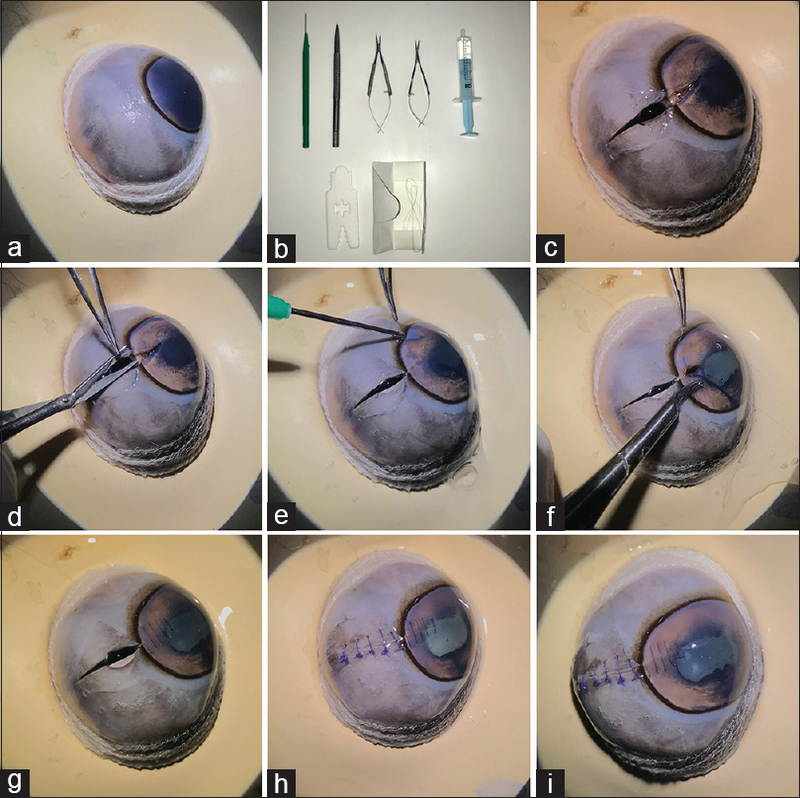 As cataract surgery is the most commonly performed surgery, previous efforts related to resident surgical skill enhancements in the literature have mainly focused on cataract in animal eyes and surgical simulators., Through this article, the authors want to highlight the importance of surgical training on goat's eye. There is a need for increasing efforts to build complex surgical skills in other subspecialties of ophthalmology as well. Among the routinely performed surgeries, traumatic globe injuries are of complex in nature and definitely pose challenges to all class of surgeons during surgical repair. In addition, severely distorted anatomical landmarks, tissue edema, and limited surgical space mandate the acquisition of finer surgical skills at an early stage of ophthalmic practice. Usually, the traumatic globe injuries encountered at a peripheral level are often referred to higher centers, even though basic surgeries such as cataract and other procedures are routinely performed. This is because of lack of experiences in handling such cases as traumatic globe injuries are less commonly encountered and/or operated by the trainees during their residency program unless it is a tertiary referral institute. The importance of the necessary skills required in this field for an ophthalmologist cannot be underestimated. Thus, necessary teaching/acquiring essential cognitive and psychomotor skills during the training period and also during the early phases of clinical practices are of paramount importance. The advantages of this technique over previously noted other techniques of any form are real tissue handling experiences, surgical manipulation with an expectation of real ocular complications, and repetition of the procedure at no additional cost. However, no technique is without its own inherent limitations, and such limitations of this technique are the absence of conjunctival and tenon's tissue, regularly created sclera-corneal wounds in contrast to the much more devastating injuries in reality, and lack of questionnaire-related responses from the residents. But here we would like highlight mainly this procedure as a technique for training, therefore making ways to future questionnaire-based studies. To conclude, this technique of corneoscleral perforation on goats' eye can be adopted as a routine training session during residency training program. This simple technique helps in the betterment of complex surgical skills at no additional cost with much more realistic tissue handling experiences. Pujari A, Kumar A, Chawla R, Khokhar S, Agarwal D, Gagrani M, et al. Impact on the pattern of ocular injuries and awareness following a ban on firecrackers in New Delhi: A tertiary eye hospital-based study. Indian J Ophthalmol 2018;66:837-40. Sengupta S, Nath M, Venkatesh R, Dhanapal P, Haripriya A. Goat's eye integrated with a human cataractous lens: A training model for phacoemulsification. Indian J Ophthalmol 2015;63:275. Alwadani S. Cataract surgery training using surgical simulators and wet-labs: Course description and literature review. Saudi J Ophthalmol [Internet]. 2018 [cited 2018 Aug 26]; Available from: https://linkinghub.elsevier.com/retrieve/pii/S1319453418300201. [Last accessed on 2018 Aug 28]. Feudner EM, Engel C, Neuhann IM, Petermeier K, Bartz-Schmidt K-U, Szurman P. Virtual reality training improves wet-lab performance of capsulorhexis: Results of a randomized, controlled study. Graefes Arch Clin Exp Ophthalmol 2009;247:955-63. Lauer A, Chan-Kai, Lauer A. Basic training module for vitreoretinal surgery and the Casey Eye Institute Vitrectomy Indices Tool for Skills Assessment. Clin Ophthalmol 2011;5:1249-56. Pujari A, Swamy DR, Singh R, Mukhija R, Chawla R, Sharma P. Ultrasonographic assessment of paediatric ocular emergencies: A tertiary eye hospital based observation. World J Emerg Med 2018;9:276-81.